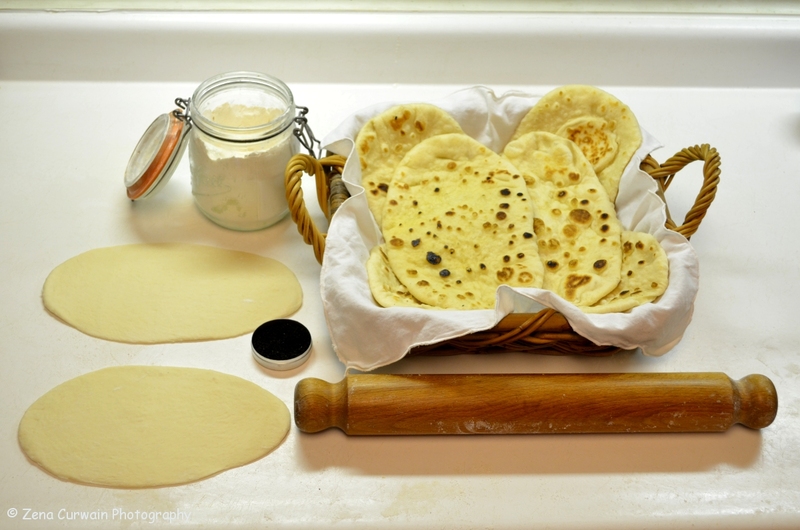 Robert and I are enthusiastic bakers, and having decided to make an Indian-inspired meal for a dinner party, we elected to try out Dan Lepard’s recipe for naan bread. What better way to mop up rich curry sauces than a nice hunk of warm bread? 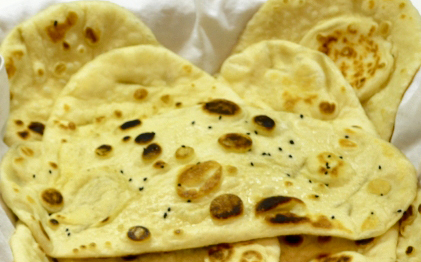 Aside from the simplicity of the ingredients and clarity of directions, what attracted me to this particular recipe was the idea of baking naan bread in a wok on the stovetop. Since we planned to have as much of the preparation out of the way as possible before our guests arrived, I started making the dough in the early afternoon, and Robert busied himself with the curry. As I was assessing what I would need, I decided against using coconut milk, and substituted a mixture of plain yogurt and water. I’ve been baking for a long time, and have some confidence in what may or may not work, but just to be on the safe side, I still like to do a comparison with other recipes. This is usually where I discover that there are a hundred different variations to choose from. A lot of “recipes” are based on what one has on hand at the time. It’s always reassuring to watch the yeast granules spring to life, and when the suggested amount of flour produced an even, pliable dough, we took the opportunity to leave the house and go for a walk. As it turned out, we were away for a lot longer than the specified one hour of rising time. At one point, I gave thought to the possibility of having over-proofed the dough, but as we strode home, I reasoned that I needn’t worry. It being the middle of winter, our house is fairly cool, and we confidently leave our “no-knead” dough to proof for at least twelve hours. On our return, the message light was blinking on the answering machine. Our guests were calling from the snow belt above Toronto. They were in the middle of a surprise blizzard that was now forecast to engulf the downtown area as well later that evening. The only sensible thing to do was to postpone the dinner party, and make the somewhat unreasonable promise that it would not be snowing two weeks later. Since the dough was ready to form, I decided to carry on with the naan experiment. As I turned the dough out onto my floured board, it showed no signs of having suffered from neglect; it was still quite springy and elastic. The total weight was over 1 kilo, so it divided nicely into 10 portions. I adhered more closely to the instructions on rising, but when it came time to roll out the balls, I questioned the need for triangles and went with the more familiar oval shape. Robert was already at the stove, so I put him in charge of the wok. As it was heating up, I thought I might prefer a plain bread, so we started the baking process with unseasoned oil and omitted the seeds. As Dan Lepard suggests, we considered the first couple of attempts to be testers, and greedily tore off chunks as soon as they were out of the pan. The first cooked naan was definitely fluffy, but way too thick by my standards, so I rolled the next one out to about 3 mm instead of 5 mm. The fan on the range hood was indispensable. I decided that plain was too plain and requested the addition of a sprinkle of salt. Then we switched to the garlic oil, which produced a nice flavour, and we decided that the nigella seeds would be a further pleasant addition. For the finale, we added cumin seeds. The trouble with so much variety is that you feel compelled to sample everything, but we managed to stop at two naan, and put the rest away in the freezer. We are delighted to report that the reheating process is fairly simple, and can be done directly from a frozen state, as long as you wrap the breads tightly in foil and don’t let them dry out. That being said, as with most bread, fresh is best.